By guest blogger, Gordon Bond. I have to admit that I knew little about Union County before moving to Union Township in 2009. My (now) wife at least had the excuse of having transplanted from Washington State. I, on the other hand, being the self-described proud native of the Garden State, had less of an excuse. It’s not that I hadn’t ventured into the area before—Cranford is the home of Amateur Astronomers, Inc., the astronomy club I belong to. And I worked for a short time in a Westfield ad agency. But when Stephanie and I decided to look for a larger apartment together, Union County was among the places we looked. A real estate agent we were working with took us to look at possibilities in Union Township. With little else to base a decision on, one thing that caught our eye as we were driven around were the blue signs along the way. Longtime residents may pass these by, but we recognized immediately that those blue signs commemorated some historic event or place nearby. That meant Union had a history… and Stephanie and I are unabashed history geeks. She works in Manhattan as an architectural historian and conservator. After a twenty year stint in the graphic design business, I’ve created www.GardenStateLegacy.com, a website and free online quarterly magazine dedicated to New Jersey history, and have begun a midlife crisis career as a history writer. All things being equal, those blue signs counted in Union Township’s favor as far as we were concerned. A community that advertised its history was someplace worth calling home. And, an inexpensive rent on a larger space in a neighborhood we felt safe taking walks in later, that’s just what we did. After unpacking and settling in, I began delving into what those blues signs were all about. To say there is a lot of history in the area is truly an understatement. After all, a fifteen minute drive from our apartment brings me to the heart of Elizabeth, a town founded in 1665. It would have to be a profoundly dull place indeed to make it almost 350 years and not have something of interest happen there. And that doesn’t even include the history of the Lenape who lived here before the European invasion or the prehistoric animals that tromped about. Indeed, there is a vast array of history that can be explored around here depending on your tastes. But in focusing on my more immediate backyard, I discovered that the area was the scene of a lesser-known but actually rather important battle during the American Revolution. People actually fought and died not far from where I now sit as I write this. One fact needs to be mentioned up front—what we now call Union Township was, back in the day, known as Connecticut Farms. That was because those who settled there in 1667 were from the colony of Connecticut. Evidently, “Connecticut” is itself an Anglicized version of the Algonquian word “quinatucquet,” meaning “upon the long river.” It was incorporated as Union Township on November 23, 1808. It wasn’t the most creative of names—there are two other Union Townships in New Jersey and it’s one of 116 in the U.S. (Indiana, Kansas and Ohio have dozens of them each). But at least it’s less confusing than including the name of another state in it. Geographically, Connecticut Farms lay around four miles northwest of Elizabeth—a position that would come to be strategic during the American War for Independence. In the spring of 1780, British and Hessian troops occupied Staten Island while General George Washington and his Continentals were hunkered down for the winter and Morristown. Between them were the Watching Mountains. While calling them “mountains” might be a bit of an exaggeration—they are also known by the more accurate and picturesque name, Blue Hills—they presented a formidable enough barrier. They are actually three low ridges, formed some 200 million years ago by volcanic activity, ranging in height from around 400 to 500 feet and cutting across the northwestern corner of the state. The one opening was where two branches of the Rahway River converged, in what was called Hobart Gap, now threaded by Route 20. If the British wanted to attack Washington, they would have to do it by that gap. And that’s just what Hessian General Wilhelm Reichsfreiher zu Innhausen und Knyphausen was contemplating that spring in 1780. More commonly referred to as simply General Knyphausen—and by American troops at the time as “Ol’Knyp”—he commanded some 6,000 soldiers. Most were his German mercenaries, Hessians who took their name from the Hesse or Hessia principality, who had been hired by England to do some of the dirty work of putting down the rebellions in their North American colonies. They had little personal investment in the conflict aside from a paycheck, but Knyphausen understood their temperaments well enough to inspire them into the fight. Also among his 6,000 men were British regiments and even units comprised of American Loyalists. Looking over this sizeable force must have emboldened Knyphausen, particularly in view of the reports his spies were returning. It had been another rough winter on Washington’s men at Morristown where a combination of disease and desertions left him with only around 3,500 men standing—and those were suffering morale issues besides. The Hessian leader saw an opportunity to crush the weakened Continentals at Morristown, dealing a severe—perhaps even decisive—blow to the hopes of the rebels throughout America. Between Knyphausen and the critical Hobart Gap lay the town of Springfield. If he could seize that, he could control the Gap. The people of New Jersey seemed weary of the war. Stuck between New York and Philadelphia, both sides looked upon the farms as one big larder to be raided to supply cold, hungry soldiers. Knyphausen had no reason to think they would put up much more than a token fight. But, between Springfield and where he planned on landing his troops at Elizabethtown also lay the sleepy little village of Connecticut Farms. At midnight of June 6, 1780, the combined British and Hessian forces boarded boats and crossed over to Elizabethtown Point. As the sun rose on the 7th, they began their seven mile march towards Springfield. Resistance was light but lucky. A shot managed to badly wounded Brigadier General Thomas Stirling, generating enough confusion that they lost valuable time. If you’ve been to Liberty Hall Museum over by Kean University, you’ve been near where the orchard stood that gave cover to the man responsible for wounding Stirling. Around 60 New Jersey militiamen, under command of Ensign Moses Ogden, fought a rearguard action there. There was no way the Americans could stand and fight head-to-head with the superior numbers of the invaders. So they opted instead for brief skirmishes that would delay the advance and buy time for assembling a more respectable defense further along. Ogden and his men were quickly scattered, but around a quarter of a mile down the road was waiting Colonel Elias Dayton with a detachment of the New Jersey Continental Brigade and more militia. They took another swing at the enemy before falling back to Connecticut Farms. They Jerseymen held the village as long as they could, until British and Hessian reinforcements arrived and drove them back at last. Seizing Connecticut Farms, the British and Hessian soldiers looted homes burned a dozen homes. All the while, Washington was on his way and sent his personal Guard unit of 153 men under Major Caleb Gibbs on ahead to do what they could. They charged a Hessian unit but after losing three killed and four wounded, Gibbs too had to fall back. Historians say that this Battle of Connecticut Farms was tactical British victory but a strategic American victory. In the short term, the Americans lost; Connecticut Farms was sacked. But in engaging with the enemy as well as they managed, the Americans stalled the advance until the onset of night forced Knyphausen to withdraw back to Staten Island. It was a prudent, if disappointing move on Ol’Knyp’s part. He had expected to have taken Springfield by the end of the day, but it was still in American hands, as was the higher ground of the Watchung Hills. He had Connecticut Farms, but it was doubtful his tired men could hold it through the night and his supply lines back to Staten Island would be cut off. As it was, their retreat was accompanied by further skirmishes and the capture of one of the British soldiers trying to guard the road to Elizabethtown. It was perhaps that mounting sense of frustration on the part of the British and Hessians that had led to the looting and burning of the village. Not that this was the first time such violence against civilians had happened in the war, nor was it endemic to the British and Hessians. But one incident in particular has gone down in history and is—oddly—even recalled in Union Township’s official seal. A stray musket shot had killed a civilian identified only as “Ball.” But it was another civilian’s death that would generate tremendous outrage. The Reverend James Caldwell had been tending his congregation in Elizabethtown, but with the war on, he went off to tend to the spiritual needs of Washington’s soldiers instead, serving as their chaplain at Morristown. With the British just over the Arthur Kill in Staten Island, his wife, Hannah, and their children, were staying in a house at Connecticut Farms. During the battle, she was shot dead as she sat there with her children. And that’s about as much as we can reliably say for a fact. The exact circumstances of Hannah Caldwell’s death entered into legend almost immediately. Some said it was a stray bullet—an accident. Some say it was intentional—a murder. In some accounts it was a Hessian who fired the fatal shot, in others a Redcoat. She may have been sitting on the bed or standing by the window. A baby may have been in her arms or there might have been a little boy pulled back from the window by a servant, Abigail Lennington, and the motion caused a jittery infantryman to pull the trigger. It may have been one ball that struck her, or it could have been two from a double-loaded musket. Certainly from the perspective of the Americans, this was propaganda gold—the wife of a minister brutally shot in cold blood, with a babe in her arms, by a cruel and monstrous enemy of liberty! What better rallying cry! If they could kill the wife of a clergyman, what other depredation were they capable of? But amateur historians, lured by patriotic drama, are equally guilty of embellishing the tale. 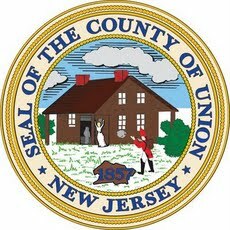 But, perhaps mostly oddly, the event is featured on Union County’s official seal—making it perhaps the only county in the nation whose emblem is a murder! And likely an inaccurate representation at that. Mrs. Caldwell is shown standing on the porch of the house (all accounts place her inside), hands flung in the air while a Hessian-looking soldier fires the fatal shot. Whatever the case—and we may never know what really happened­—the reality remains that the poor woman was indeed killed, leaving a grieving husband and children. General von Knyphausen was not one to give up easily. With encouragement from Lieutenant General Sir Henry Clinton, the British commander-in-chief in North America, they would try the plan again two weeks later. But this time there would be a two-pronged approach, as opposed to the more basic one-punch assault of before. One column would leave Elizabethtown along Galloping Hill Road and head for the already harassed Connecticut Farms and on to secure Springfield. A second would bypass Springfield on Vauxhall Road to the north and head for Hobart Gap, where they would meet and continue on over the relatively flat ground to Morristown. Clinton believed this would draw Washington to send the main part of his army around the northern part of the Watchung Hills, just west of Newark, in what would appear to Washington as a logical opportunity to hit the column’s right flank. If he took the bait, however, Clinton had positioned Major General Alexander Leslie up the Hudson Rover with 6,000 men to cut off Washington from the safety of the Watchung Hills while Major General James Robertson sat at Elizabethtown with 1,865 men ready to protect the rear of the columns and reinforce Leslie. Anticipating another assault, the Americans had a small guard at Elizabethtown and Major General Nathanael Greene sat at Springfield with around 2,400 men. Sure enough, at 5:00 a.m. on June 23rd, the enemy reinvaded Elizabethtown Point, easily sweeping away the minor American forces and even managing to capture three small cannons and some men. But enough escaped to alert the rest that the enemy was on the way. Brigadier William Maxwell sent Colonel Elias Dayton to guard Galloping Hill Road and Henry Lee to guard Vauxhall Road. He positioned troops in three defensive lines along Galloping Hill Road and near the bridge on Vauxhall and they dug in. After a brief engagement, Maxwell fell back to Connecticut Farms. At first, the Americans were able to hold the village, outnumbering the initial British assault two-to-one. But reinforcements turned the tide and the Americans lost Connecticut Farms for a second time. Attention was now turned to the bridge on Galloping Hill Road, where it crossed the Rahway River. Knyphausen made a direct assault with some 3,000 troops while he sent the bulk of his army north to Vauxhall Road in hopes of outflanking the defenders of the Galloping Hill bridge. Knyphausen’s force swung six cannon into position and began bombarding the Americans, who only had a single cannon with which to answer. Nevertheless, they managed to stave off two enemy charges as the countryside thundered with an all-out artillery battle. Rev. James Caldwell, whose wife had been killed at the Battle of Connecticut Farms, was on the scene. When the gun ran low on paper wadding, he was said to have grabbed an armful of hymn books published by the English clergyman Isaac Watts. The pages were torn out and used as the Reverend allegedly entreated the soldiers to “Give ‘em Watts, boy!” Whether more apocryphal than true, the Americans held on as long as they could. Two British regiments and Hessian Jagers forded the river and over the next nearly half an hour, slugged it out, moving tree to tree and at last drove the American back. Seeing they couldn’t hold the line any longer, General Greene ordered them to fall back to Bryant’s Tavern up on the higher ground of the Short Hills. Springfield was, at last, Knyphausen’s. A similar drama was played out at the bridge on Vauxhall Road. An artillery bombardment pushed the American back in a fighting retreat all the way to the Short Hills. Seeing the Americans on the higher ground, however, and the arrival of reinforcements convinced Major General Edward Mathew to halt the advance and join Knyphausen at Springfield. Yet, here again, though the British and Hessians had achieved the immediate goals of taking the town, the ultimate prize of Morristown and Washington’s Continentals seemed pushed even further out of their grasp, the path clogged by an ever-growing number of American militiamen. While defenders of Connecticut Farms and Springfield lost the towns, they did manage to delay the enemy long enough for those new troops and cannon to get into position in the hills, making reaching the Hobart Gap seem increasingly like a deadly fool’s errand. By midnight, Knyphausen ordered another retreat to Staten Island, but first had the entire town of Springfield leveled except for four Loyalist houses. The retreats, back down Vauxhall and Galloping Hill roads, was harassed by snipers the whole way. The residents Connecticut Farms and Springfield had sacrificed much in lost homes, property and lives. Yet their show of strength between the two battles convinced the British command that New Jersey was lost. Indeed, the whole of the northern colonies were conceded as they concentrated their efforts further south instead. Between the two battles, the British lost 25 killed, 234 wounded and 48 missing. The Continentals lost 35 killed, 139 wounded, 10 prisoners and 22 missing. This was no small skirmish. “They flew to arms universally and acted with a spirit equal to anything I have seen in the course of the war,” Washington later wrote of the militiamen who flocked to the battles. As I sit at my desk writing this on a rainy October afternoon, I can hear the traffic along Galloping Hill Road. I can peer out my window and see where British and Hessian troops once marched up in hopeful anticipation of a decisive victory. And back down again in frustrated retreat. Right in my own Union County backyard was the tipping point—where America first really began to slip from the grasp of the greatest military power of the age. Obviously, this is but one of many, many stories that give Union County a certain pride of place and I’m still learning stuff. I’m sure glad we noticed those blue signs!